Fleas can be dangerous for a small dog such as the Yorkshire Terrier. The fleas can easily cause anemia and infections that can overcome the Yorkie and cause illness or even death. Providing the Yorkie with the proper flea medication to treat and prevent an infestation is essential to the health and well-being of the dog. Preventing a flea infestation is the first step to providing a Yorkie with a flea-free lifestyle. The most common method for preventing a flea infestation is the use of a topical flea prevention medication such as Advantage. This medication is applied directly onto the dog's skin in two places, and makes the skin toxic to any fleas that may attempt to bite the Yorkie. Flea medication also can be administered in a monthly pill, although this method is only available through a veterinarian's office. Flea powders, flea sprays and flea collars are limited in their effectiveness. What's more, flea powders and sprays also can be ingested by the Yorkie while grooming, causing a potentially lethal poisoning. Keeping a Yorkie clean is the first step in the treatment of a flea infestation. Most shampoos will kill fleas, although a flea shampoo also should prevent the immediate reinfestation of fleas. When bathing the Yorkie, form a ring of thickly lathered shampoo around its neck. This ring of shampoo will prevent fleas from clustering on the head of the dog, where shampooing can be difficult. Once this has been accomplished, wash the Yorkie, using enough shampoo to form a thick lather. This lather will dislodge the fleas from the Yorkie and cause them to fall into the bathwater, drowning them. Flea dip is a solution that kills fleas on contact and prevents the fleas from infesting the Yorkie immediately after the dip. This method should not be used on sick or young dogs, as it can be toxic to the dog as well. To complete the dipping process, a container large enough to hold the dog should be filled with dip solution, cut with water to match the recommended ratio. The Yorkie should be placed in the dip and the solution should then be spread onto the dog, completely saturating the Yorkie's fur. Rinse off the excess dip solution before drying the dog. Flea combs remove the fleas from the Yorkie while grooming its coat. This method removes the fleas by trapping them within the teeth of the comb. 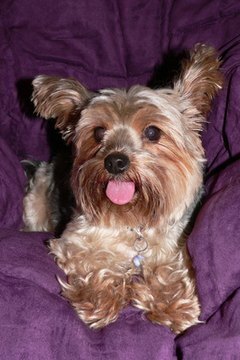 The comb should be dipped in water after every stroke to prevent the flea from being redeposited onto the Yorkie's skin. While this is not a medication, it can be used in conjunction with a flea medication. Flea combs also can be used to assist in determining the need for a flea medication. Ridding the Yorkie of a flea infestation is only part of the battle against fleas. Fleas can and will live in the carpets and soft fabrics of a home, as well as the yard, and they can live for years in a larval or pupal state. This can make it difficult to get rid of the pests permanently and can make it difficult to prevent the reinfestation of the Yorkie. Using a flea medication such as flea powder or spray on the yard and in the home can kill existing fleas, but because the flea is immune to all of this while in the pupal state, the continual cleaning and treating of the home and yard will be necessary.